multiple parts of the body, ie the skull, spine, ribs, hips and long bones. In my case, before diagnosis, the Myeloma had managed to break 5 vertebrae, several ribs, damaged my hips and has made holes in my skull and long bones. Treatment is very rigorous and I’ve had radiotherapy, spinal surgery to T5, chemotherapy and a stem cell transplant in January 2015. It is a very painful cancer and is currently incurable, ie, although I’m currently in remission (for just over 2 years now – yay!! ), it will return one day. Before my diagnosis I was working full-time in my own business (my daughter has now taken this over), loved travelling to exotic places, and really enjoyed water sports. My husband, Dave, has owned Boatworld for 40 years so I have been very lucky to have tried scuba diving, snorkelling, white water rafting, knee boarding and other similar water-based and outdoor activities. A business colleague and lovely friend, Faye Smith, from Keep Your Fork (there’s more to come!!) introduced me to CCTA. It sounded amazing as, at that time, I had lost confidence, was still in quite a bit of pain and suffering from fatigue. I felt that, apart from gentle walking, my outdoor activity life was over because the cancer leaves you with brittle bones – 16-18 times more likely to break than normal. I also had a lack of confidence in my ability – I’m sure those of you who have been touched by cancer can appreciate this. Faye urged me to give CCTA a call, which I did in September 2015, but although they were extremely helpful and put my mind at rest, I was still very wary – it almost sounded too good to be true and it was a full year (September 2016) before I eventually rang again, met with James, and the germ of the idea began. James and I discussed that I needed to do something that would give me a soft landing, that I would love to be in water and that I would like to travel to exotic places again. I was doing well with my recovery at this time so told James that I felt guilty to be applying for funding to do this, but he very quickly put my mind at rest by assuring me that I couldn’t have done this type of adventure whilst I was in treatment or recovery! 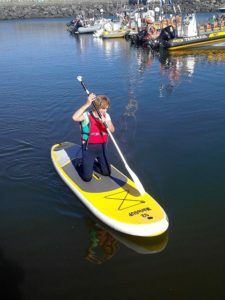 Stand-up Paddle Boarding (SUP) seemed a perfect choice and I chose the Azores as it was the only place I had on my ‘bucket list’, I wanted to try it in a warm climate, and it wasn’t too far – off the coast of Portugal. 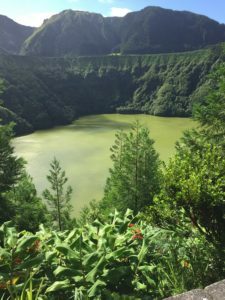 The Azores consist of nine main islands, the biggest of which is Sao Miguel, so we chose this island as it has the most facilities. CCTA also paid for my husband, Dave, to come too as I am unable to carry bags and it was amazing to have my husband doing it with me. He had gone through so much looking after me that it was fantastic that he would be part of my challenge too. Planning the trip was complex, but exciting. It took me a long time; finding someone to teach me, researching budget flights from a northern airport, searching for accommodation etc. 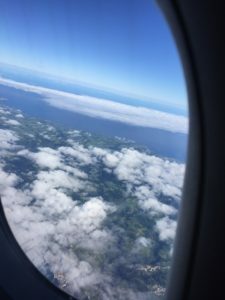 We stopped over in Lisbon for the first night and flew over to Ponta Delgado on the island of Sao Miguel on the 24th July, picked up the hire car and started our journey to Furnas – our home for the next 8 nights in the Airbnb apartment I had arranged. What should have been a 1.5 hour drive took us about 3 hours because we were overwhelmed by the breath-taking scenery and therefore stopped several times along the way to take in the beauty of this stunning island. 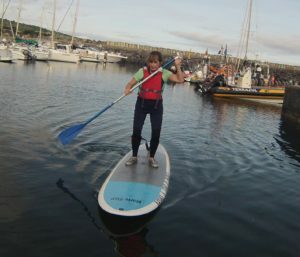 So as not to lose any time we had arranged to meet our SUPing company in Vila Franca Do Campo that evening – because the conditions were usually better for SUPing early evening, we met them at 6pm. Our small family team consisted of Pedro the teacher, Maria, Pedro’s wife and business partner, and Mario, their 4 year old son whom they had named MarioSup after. 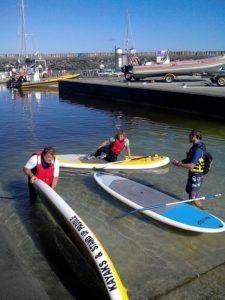 We started on our knees and paddled slowly out into the small harbour where there were no waves. As soon as we were confident paddling on our knees and we were underneath the harbour wall, with no wind, Pedro instructed us to attempt standing. Dave actually stood up, very slowly, but he had done it!! It can’t be that hard, I thought, and attempted to stand. Obviously, I fell straight in, but I absolutely loved being in the water and came up feeling exhilarated and giggling. It was a very good lesson in how to get back on the board, which took me about 10 minutes of wriggling, cursing, laughing and heaving until eventually Pedro had to help me on. After 5 mins of laying down and resting on the board we finished the 2 hour lesson, gaining confidence in kneeling, standing, turning and getting back on the board. After the lesson we were exhilarated, happy but exhausted, and arrived back in Furnas at 9pm. We had a very quick meal and collapsed! We took the second day off to recover and, although we had arranged to SUP on the third day, it was raining and foggy and we were disappointed to learn that we couldn’t try out our newly learned skills on any part of the island as the light wind in the harbour made it too wavy. We tried to spend the day sightseeing, but had to turn back because the fog and rain made it impossible to see very much at all. So we spent the afternoon exploring the underground volcanic geezers in Furnas. It was a great day and we felt very confident and pleased with our new found skills. I was delighted that my body seemed to be coping well with it. The third (evening) lesson (our sixth day) was to include getting out of the harbour into Vila Franco bay – the conditions were good and we were very excited to be let loose on the open sea. We paddled out of the harbour on our knees to get the feel for the waves. Again, Dave got up first time and so did I and we paddled round the bay, very slowly, and gained lots of confidence. However, the waves suddenly got slightly higher and Dave fell in. Pedro went to help Dave back on his board because he was finding it tricky. A few moments afterwards, I fell in, got back on the board, and attempted to stand up, but I started to get cramp in my ribs and back. This was a very scary moment for me – I had drifted away from the guys, was very close to the rocks and I felt panic rising. I lay down on the board using my paddle to keep away from the rocks, used meditation and relaxation techniques (which I had learned to help me with my pain and treatments) and waited for them to come and help me. I was OK by the time they got to me, but we had to cut this lesson short because I was exhausted from the pain. I was very disappointed. We got back to shore and at this point I almost gave up. I was annoyed and disheartened at the after-effects of my illness. Once I was showered and warm and dry Maria gave me a beer, Mario gave me some of his pea shoot snacks (which he loved more than Haribo’s), Dave massaged my ribs and Pedro explained the next day’s plan. Earlier in the week I had told him that I wanted to attempt to practice Yoga on the board, preferably in a morning lesson, so Pedro suggested that for our last lesson we do it the following morning in Caloura – the next big bay round from Vila Franco. He said this would be a perfect place, ie sheltered, spiritual and of outstanding natural beauty. The warmth, generosity and encouragement of this lovely family spurred me on so we were up the next morning at 7am and met Pedro at 9am. Unfortunately, the conditions were not very good again, so our trip to Caloura was off. However, we were able to go in the harbour where we took it very gently and I actually did some Yoga moves on the board including Downward Dog, Plank, Cat, Cobra and Child’s Pose. Not difficult poses but I can’t explain the feelings it gave me and how proud of myself I was. It was absolutely exhilarating for me and I truly loved it. We spent our last afternoon on Sao Miguel whale-watching and visiting Coloura to take a look. On the eighth day we travelled back to the airport and were both very sad to leave this beautiful island. 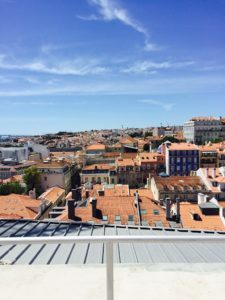 We spent our last two nights recovering in Lisbon and had a fab time exploring this beautiful city. I genuinely cannot thank CCTA enough for giving me this wonderful experience, Dave for coming along to help me, and the guys at MarioSup for their warmth, friendliness, encouragement and, of course, amazing teachings.